Temporary workspaces are so much fun! You move out of your personalised space and set up shop at a different location. A visit to the unknown rejuvenates the mood and makes your workspace dearer on return. I change my workspace often when back home. Pack up my little bag and head to a cafe, settle down with a new view from the corner table, order myself a cuppa and get down to work. Sometimes I even indulge myself with a gooey treat. Or a spicy one. Do I get work done? Most times, yes. But there are times when I don’t. And I’m still learning not to beat myself over that. Sometimes, it’s okay to sit and watch as the world goes by, right? I’ve had a new workspace this past month. Happens when you take over the only study in your sister’s home! It’s a lovely little room with a nice desk and a view of two tiled roofs. If I tilt my head to the right, I can even spy on the neighbour’s garden. Most often, it’s the gorgeous sky that keeps me hooked. But there have been days, like yesterday, when the gloomy weather put a dampener on my spirit. It pulled out the demons in my head –very Dementor-ish (if you know what I mean?) – and made me mopey. Do you have such dismal days? How do you deal with that sinking feeling? Tell me… a few tips will help a long way. Had I been back home, I would have called a friend or two for a cuppa. The best way to beat the blues. But in the suburbs of Bristol, that’s kind of difficult. But one can always count on family to pull you through, in my case, the parents. “Why don’t you make something interesting for lunch,” said Baba. “Let’s make omelette jhol (curry),” said Maa. I don’t remember the first time I ate ‘Omelette Curry’. Maa doesn’t remember where she learned it from. What she does remember is that the first time a bowl of ‘omelette jhol’ was placed on the dining table, it was a roaring success! “That’s enough for me to make this dish. And it’s been a saviour on many days when the refrigerator has been barren and we’ve had unexpected guests who joined us for a homely dinner,” said Maa as she rattled off the recipe. The dish is literally what it says. A thick omelette is cut into pieces (of your liking) and cooked for a few minutes in a curry (of your choice). I prefer the basic Indian curry and a bit on the spicy side. Nothing kicks up the mood like a dash of spice. 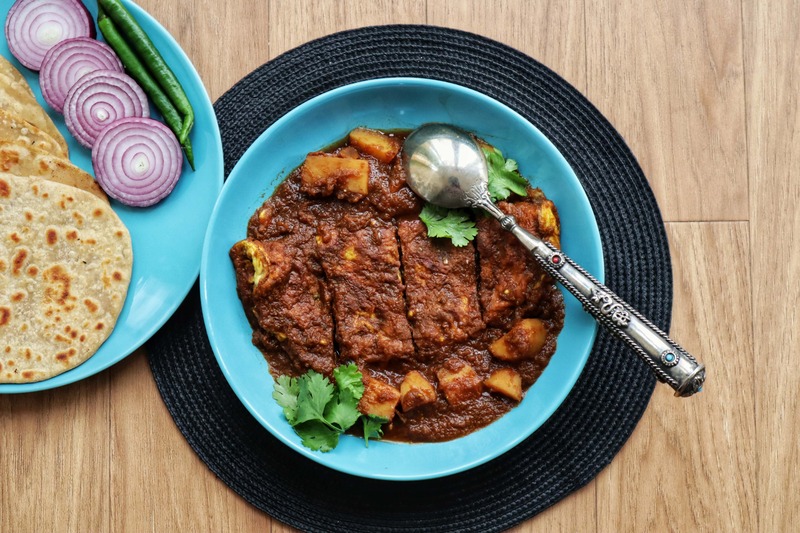 You can use this curry as base for meat, poultry, fish, and vegetables. Or dunk leftover omelette in it. P.S Do you ever have leftover omelette? If yes, how!? The ‘omelette curry’ is best eaten piping hot with steamed rice. But it tastes as brilliant with paratha, chapatti or other breads. Pair it with whatever rocks your boat. Or better still, make it a one-pan meal; consider this just another way of making omelettes much more fun. For the beginners, trust me when I say this is the perfect dish to impress those ‘cooking’ critics. Silence them with this wonder! Dense omelette cooked in spicy Indian curry makes for a perfect one-pot meal. Crack the eggs in a bowl. Add milk, salt and whisk well. Heat a tablespoon of oil in a non-stick pan. Once the oil is hot enough, pour in the egg batter, sprinkle with the minced onion and green chillies. Cover and cook till the edges are golden brown. Flip and let the other side cook for a minute. Set aside. Roughly chop the onion and tomatoes. In a food processor, pulse the onion, tomatoes, green chillies, garlic, ginger and one tablespoon of water into a fine paste. In a deep frying pan or kadhai, heat 2 tablespoons oil. Once the oil is hot enough, slowly pour in the onion and tomato paste. Be careful. This paste tends to splutter and splatter as it touches the hot oil. Peel and cut the potato into chunks. Ideally, you should fry the potatoes till they are cooked, set them aside and add to the curry at the end. BUT. I was in a hurry. So I added the potato chunks to the cooking paste. Add coriander powder, cumin powder, turmeric, red chilli powder and salt as per taste. Mix well and cook until the paste starts releasing oil. Add 2 cups of water to the cooked paste. Stir well and bring to a boil. Note that the omelette will absorb the curry. If you want that extra curry to soak your break in, add an additional half a cup of hot water. If you need more, add the remaining half cup. Bring to a boil. Check the seasoning and adjust as per taste. Poke the potatoes to ensure they are cooked. Slice the omelette as you wish. I cut a folded omelette into four. You can cut the round omelette like a pizza. Slide the omelette pieces into the pan, ensuring they are covered in the curry. Simmer for five minutes. Remove from flame. Garnish with some fresh coriander leaves - if you wish to - and tuck into it piping hot with some steamed rice or paratha or any bread.